They’d better not. It’s not because manuka honey is honey, a really sweet food, because diabetics CAN eat honey, but they SHOULD NOT eat manuka honey. This is the subject of the article Can diabetics eat honey?, which describes why scientists consider this food more than just sugars, and what studies have proved this by now. On the other hand, if your honey is very, very old, or has been heated at high temperatures for a long time, than diabetics should avoid them, too, for the same reason for which manuka honey is contraindicated: methylglyoxal content (MGO or MG). Long storage and temperature favor Maillard reactions, which lead to formation of MGO. Why isn’t manuka honey good for diabetics? Because of its MGO content. The same substance that makes it such a good antimicrobial product. Nothing to worry about its glycemic index (GI) as it is lower than that of sucrose – the refined sugar which should be avoided by diabetics. Besides this low GI, other minerals and vitamins in honey assist in balancing the blood sugar. Please see the article mentioned above for all compounds in honey that help in diabetes and what doses are to be taken. You have probably heard of it as: PROPANOLONE (I’ve heard of this before, but never knew we have it in our body! 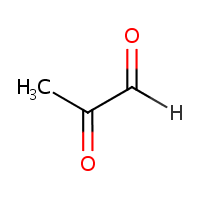 ), 2-OXOPROPANAL, PROPANEDIONE, ACETYLFORMYL, PYRUVIC ALDEHYDE, ACETYLFORMALEDEHYDE, ALPHA-KETOPROPIONALDEHYDE, 1-KETOPROPIONALDEHYDE, 2-KETOPROPIONALDEHYDE, NSC-79019, PYRORACEMIC ALDEHYDE, Pyruvaldehyde. I have no idea why there are so many synonyms and identifiers for this substance. It’s a toxic substance. More correctly put, a toxic physiological metabolite, which normally exists in a healthy body without creating any problems. It is formed through non-oxidative mechanisms from triose phosphates during anaerobic glycolysis. Yet, the amount of MGO can be too high and sicken the body. 3. Exposure to exogenous dicarbonyls may increase. Meaning, we can bring it inside our body from exterior, from food, water or air. We ingest small quantities of MGO every day in our food. It’s a coffee aroma constituent (in our home-brew and instant coffee), it is found in edible oils (sesame, safflower and sardine oil) and in a component of beef flavor. We can inhale it through different complex chemical compounds such as pyrethrins, tanning leather, flavoring. We can even buy it: commercially it is supplied as a 30% aqueous solution. If we supplement our food with manuka honey, the quantity of ingested MGO will increase. According to how big this quantity is, a body can benefit from its antibacterial activity and scavenge the unnecessary MGO out. If the quantity is very high, it is most probable that not even a very healthy body will be able to metabolize it completely. Isn’t our body able to get rid of this MGO? It is. The majority of MGO is metabolized through glyoxalase 1 and 2 (GLO1 and GLO2) into d-lactate. The rest (a small amount) is eliminated by the kidneys and excreted via urine. Conclusion? Our body cannot handle too much MGO. – Methylglyoxal reacts with proteins (reacts with arginine, lysine, and cysteine residues of proteins), causes protein dysfunction, and generates advanced glycation end products (AGEs). This activates the receptor for advanced glycation end products (RAGE), which causes chronic inflammation and increases oxidative stress. Methylglyoxal and AGEs are thought to stimulate chronic low-grade inflammation, lower pain thresholds, and promote oxidative stress. – Methylglyoxal reacts with DNA and causes cellular toxicity via reactive oxygen species (ROS). Studies have shown that Methylglyoxal induces cell apoptosis or direct cellular toxicity with necrosis. Yet, the tissue or cellular regulation of MGO metabolism in response to different stress or damage conditions is not fully understood. Facing tissue damage, some diseases exhibit extremely high MGO levels locally, with only minor elevation of systemic MGO levels. also read: Is Manuka Honey safe to eat? High MGO levels are found in diabetic patients, and are thought to be due to excess blood sugar. In the medical world methylglyoxal and AGEs are called dicarbonyl stressors and are widely accepted as pathogenesis factors in diabetes. These dicarbonyl stressors are responsible for many diabetes-related complications. In the case of painful diabetic neuropathy, it is observed a lower glyoxalase activity, which leads to heavier carbonyl stress. Whether it is up-regulated or down-regulated, the glyoxalase system is overwhelmed by hyperglycemia-induced MGO overproduction. Dysregulated MGO joins the set of conditions preceding diabetic complications, and marks diabetes progression and prognosis. Plasma MGO and MGO-related AGEs can be prognostic markers for diabetic complications. Methylglyoxal lowering agents have been proposed, analogous to sugar lowering medications such as metformin. Metformin is used as anti-diabetic agent and is approved by US Food and Drug Administration as an MGO lowering agent. MGO content is also high in other diseases, with normal sugar levels. The study Evolving Evidence of Methylglyoxal and Dicarbonyl Stress Related Diseases from Diabetic to Non-Diabetic Models, conducted by Wen-Chuang Wang et al., from Chia-Yi Christian Hospital, Taiwan, and published in 2016 by Pharmaceutica Analytica Acta, discusses the potential role of MGO in the aging process through increasing oxidative stress besides causing AGEs formation. The study underlines that although MGO and AGEs are widely discussed in the context of diabetes and until recently, MGO was thought to result from insufficient blood sugar control, other diseases with normal sugar conditions, such as hypertension, sepsis, and renal disease, are increasingly recognized as MGO-related. Besides, plasma MGO, and not blood sugar, distinguishes diabetic patients with no pain from those with pain. This ability brings to MGO a new applicability to disease diagnosis. Growing evidence shows that MGO and dicarbonyl stress may not only contribute to complications in these systemic diseases, but may also contribute to initial disease pathogenesis. Lots of research is focused today on developing specific and effective scavengers and crosslink breakers of MG and AGEs that can become potential treatments to slow the aging process and prevent many diseases. More than 600 million people suffer from high blood pressure worldwide, being more likely to experience strokes, heart disease and kidney failure. A diet high in sugar or low in antioxidant vitamins can lead to insulin resistance, altered glucose metabolism, low tissue glutathione, hypertension and oxidative stress. Although there is a lack of solid clinical evidence, MGO is considered an important contributor to the pathogenesis of hypertension without diabetes, based on both in vitro and animal model. Higher MGO, AGEs, and oxidative stress are also found in SHR renal tissue and aortic endothelia. The study’s conclusion: A diet rich in these antioxidants may be effective in preventing and controlling hypertension in humans. Specialists have also noticed the connection between MGO level and sepsis. Sepsis is an infection accompanied by a systemic inflammatory response to an infection, followed by multi-organ dysfunction even in uninfected organ systems. These events frequently lead to death. An observational clinical study used MGO to promptly identify patients with septic shock, more effectively than other indicators, including procalcitonin, C-reactive protein, soluble CD14 subtype, and interleukin-6. The book has 198 pages, it costs $14.95 on paperbark and $14.39 on Kindle. The book is a complete guide on how to efficiently use vitamins, especially from the B complex, and which supplements are most important for people with diabetes and why. The book cover vitamins and supplements and not much about diet. For this I recommend for example The Schwarzbein Principle: The Truth about Losing Weight, Being Healthy and Feeling Younger . Ian E Brighthope was president of The Australian College of Nutritional and Evironmental Medicine and founding director of the Orthomolecular Medical Assocation of Australia. Andrew W. Saul, M.S., Ph.D., is editor-in-chief of the Orthomolecular Medicine News Service and is on the editorial board of the Journal of Orthomolecular Medicine. Has published more than 180 peer-reviewed articles and has written or coauthored 12 books. As with everything in life, perspective changes things. MGO is antimicrobial and this is helpful in treating skin infections. New Zealanders have invested a lot in researching the benefits of MGO on our bodies. Manuka honey is excellent for topical use, showing great results in killing bacteria such as: Bacillus subtilis, Ascheria coli, Pseudomonas aeruginosa and MRSA. The same result can be obtained from other Leptospermum honeys, and mostly from Berringa honey – which is recognized as having the highest amount of MGO. MGO is a potent apoptosis inducer and this may have a potential for cancer treatment. 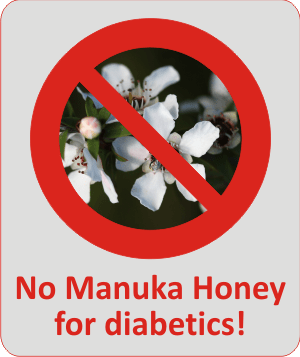 Can diabetics use manuka honey on diabetic ulcers? According to the study “Methylglyoxal—A Potential Risk Factor of Manuka Honey in Healing of Diabetic Ulcers“, by Juraj Majtan et al. from Slovak Academy of Sciences, Slovakia, published in 2011, MGO and AGEs play a role in the pathogenesis of impaired diabetic wound healing and can modify the structure and function of target molecules. This commentary describes the concern that MG in manuka honey may delay wound healing in diabetic patients. Eddy and Gideonsen in Topical honey for diabetic foot ulcers reported a case where ordinary honey was applied to patient’s heel and forefoot diabetic ulcers in order to avoid the leg amputation. Granulation tissue appeared within 2 weeks and the ulcers healed in 6–12 months. Conclusion: diabetics should avoid using manuka honey (or Berringa honey) on diabetic ulcers. Other non-manuka honey can be used. What type of honey is recommended to diabetics? Basically a diabetic can eat any type of honey, not only those honey with a low GI, such as acacia honey. But if you want to eat honey for its antimicrobial benefit, replace manuka honey with one that doesn’t contain MGO, but still shows powerful antimicrobial activity. For example: Revamil Honey (highly recommended), jarrah honey (be sure it’s fresh), sidr honey, blueberry honey, buckwheat honey, chestnut honey, heather honey, cotton honey, fire-weed honey, honeydew honey, tualang honey, neem honey, ulmo honey. Remember that only fresh and unheated honey has optimum antibacterial activity. Is Berringa Honey aka Australian Super Manuka Honey aka Jelly bush Honey better than MANUKA HONEY? What gives honey its antimicrobial power? This is by far one of the most engaging posts that I have read on MGO and Manuka honey in general. I have been eating manuka honey as a diabetic for a few months now. I usually eat 2 spoons a day. However, I started doing this in order to treat my IBD (Irritable Bowel Disease). So far I haven’t had any negative results, only positive. But, I am certainly visiting the links to the studies you posted. Its made by Capilano, so not sure what country your in or wether it can be sourced there, but have a look, it might be suitable for IBD and doubled down with probiotic yogurt, even better perhaps? Honey is good for diabetics. As for manuka honey, it also depends on the quantity of MGO it contains. There is even manuka honey that has really low levels of MGO. That honey is good for diabetics. However, let’s not forget the importance of our belief in our healing, like in everything else.